Dimensions: Nagasa: 26 1/8", Nakago: 9", Mihaba: 1 5/16 ", Sakihaba: 1", Kasane: 9/32", Sori: 5/8"
Mountings: WW II gunto with one piece habaki. These are Naval swords that have seen land warfare. Commonly referred to as Marine landing swords and were used in the Pacific theatre by Japanese Naval Landing forces during WW2. Some pretty well done field repair in the upper and lower leather scabbard section. Leather did not hold up very well in the tropical weather of the Pacific islands. Overall Condition: The blade is in good condition with no forging flaws. The number 830 is stamped in the nakago (see picture). The leather on the saya is rough but all there. The tsuka is solid but about 50% of the material under the ito is gone. 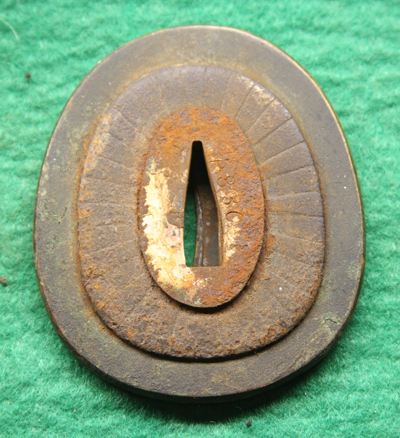 The tsuba has some significat rust on one side (see picture). The habaki is in good condition but much of the silver wash is gone.